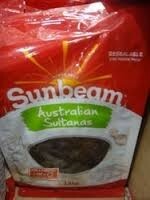 Sunbeam company has been around since 1926 and now makes available a 1kg resealable stay fresh pack of sultanas. These moist Aussie sultanas are great for snacking, added to cereal and of course, ideal for baking. Did you know all Sunbeam Sultanas are dried in the intense Australian sun for at least 12 days before harvest which helps create the super sweet flavour. Sunbeam selects Thompson Seedless grapes grown across the Riverland, Mid Murray and Sunraysia regions of Australia.